One 60-minute Day 2 level is complete in the #TVWSOPCircuit Main Event and the field is down to 90 players, with 63 making the money. Three tables to the money today, the mincash is $2,938, the winner takes home $188,686 plus a circuit ring. 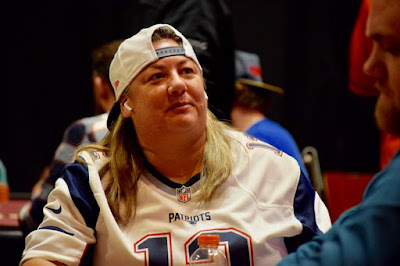 Former TVPokerRoom Monolith champ Kathy Stahl (above) is set up at table 2 with a good view not only of today's play, but also of her beloved New England Patriots who are trying today to get to the Super Bow.